universe …. uh, well, I’ve been working. All will be revealed soon. This podcast is the first podcast I’ve ever made. be new to novices and some veterans. Fan Pages. Your feedback is much appreciated. Was it too long? too short? Was the sound quality good? Was it easy to access and listen to? Mashable announced that Google unwrapped it’s own new location-based service named “Hotspot” tonight. I have yet to play with it but from the description – easy to use, simplistic, easy to write reviews – it seems like something non-techy people might get into or, at the very least, utilize when researching businesses – need a place to eat? – while on the go. Whether the “average” person leaves a bunch of reviews is moot, in my opinion. Reviews will be left in the same manner that they have been on Google. The only difference will be that there will be one more venue with which to leave a review. The fact that Google is still the dominant way in which most consumers start a business search leans heavily in their favor. Even with Facebook Places’ shadow ever present, in this arena – reviews- Google definitely has the edge. This development also should encourage business owners to shift reviews back towards Google Place pages, especially if “likes”, “dislikes” and number of reviews left are weighted factors in Google search results as seems to be indicated by this article. This story is definitely still developing so it’s way too early to foresee any definitive ramifications from this. I can definitely tell you that you should stay tuned, I will be. Oh, and if anyone has an Android phone, supposedly this is accessible immediately. If you want to check it out and comment back, that would be appreciated! There’s a big hullabaloo going on right now about Facebook wanting business owners to merge their new “Places” page with their “Fan” page. The Facebook system is even prompting administrators to do this when you go to “claim” your Facebook Place page so that you can start serving up “deals”. At the moment, the general consensus is that you should NOT merge the two but rather keep them as separate pages for the time being and administer them each separately. The merge basically migrates your “fans” over to the Places page and makes that your fan page. The design of the Places page is poor in that it detracts from the ease at which your fans can communicate with you. It is much more difficult to interact on the Places page than on your fan page. You also lose the ability to have custom landing tabs with the new Places page. All those nice graphic messages you had created…. gone. You will end up with a page with a big map at the top and lose a lot of your editing abilities. It is so bad that people are actually abandoning their “merged” page and starting all over again with a new fan page. That’s how much people are not liking the loss of functionality and design capabilities. There was even a Facebook group created and an article written on AllFacebook.com about this issue. Here’s an example of a merged page – before and after. My advice for now is to go ahead and claim your Places page but, when prompted to merge your Places page with your Fan page, say “No Thanks”. Once you merge them, you can never go back. I blogged about this here on DrivingSales on Oct 6th, and according to this article from ABC News, Google is now rolling out the “Instant Previews” search feature over the next couple of days. All I can say is that you better know what people are seeing in the preview of your website very quickly after this feature goes live. Now, instead of bouncing from your website, they’ll just never have to go there. I’m still unsure how flash-based websites will translate into a “preview”. It “could” be that it just shows as black IF it is a live preview (versus an image). SEO on Google has just added a new dimension to your search results. Now not only do you have to worry about WHERE you show up in search results but also HOW your website appears in the Instant Preview. I’m sure you don’t want people “bypass(ing)” your website. I, personally, think this is a HUGE game-changer. Websites that have relevant, “preview-able” content are going to get more traffic. Have you ever wondered who the fans of your Facebook page are? This is definitely valuable information and more comprehensive than the Facebook analytics offered within Facebook itself. 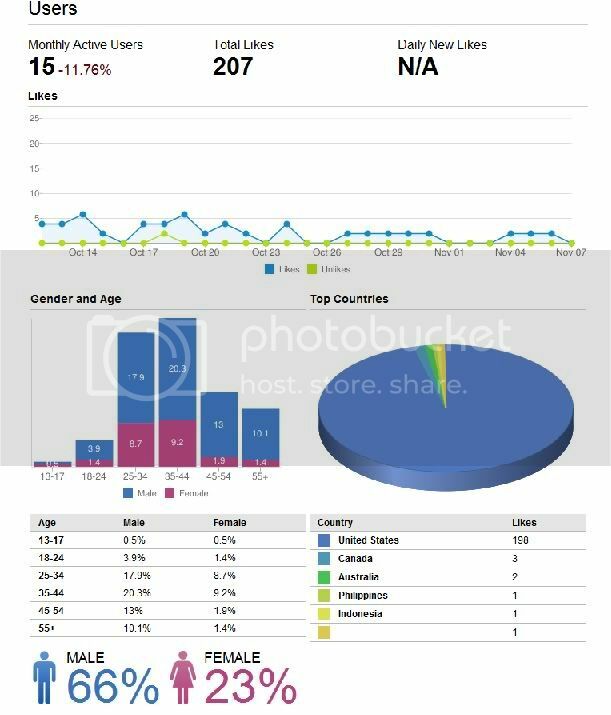 There is more to the report including Interaction data and Daily Page Activity (which are readily available through Facebook’s reports so that’s nothing new) but the demographic data is strong. I blogged about News Feed Optimization awhile ago. Since page and content interaction is incredibly important in determining whether or not your fans see your posts, this information is invaluable. In the example above, since we know that 66% of the fans are male, there would be a couple of strategies you may want to employ. First, since the goal is more interaction, you may want to concentrate on male-oriented content. The second would be to work on increasing your female base of fans. You should know your product’s demographics so why wouldn’t you want to encourage and/or grow your Facebook page demographics to match your products demographics? This information will also allow you to identify which content is actually generating activity which would then allow you to utilize similar content in the future. If posting pictures of modded cars gets you a lot of responses, you’d want to post more of those. If you have a predominately female fan base and you see that the recipe you posted for cookies got a lot of attention and interaction, you post more lifestyle-type posts. Of course, this information requires you to be a Hootsuite user to obtain (for now at least). In what ways do you think this information could be used to better leverage your social media marketing efforts on Facebook?